Experience the world-famous Tabernacle Choir in an open rehearsal. The rehearsal site is just a short walk from the Salt Palace on Thursday evening. Celebrate a wonderful conference at the AOSA Banquet. The Mimi Knowles Band will get your toes tapping while you party on! Plan ahead to share a table with local chapter members, colleagues from your summer levels course, or a group of friends from across the country. Table reservations will be open in October. On Wednesday, greet old friends and meet new friends at a Celtic dance session led by Ray Mullins. On Thursday, come sing and dance with Julie Scott, or drum along with Marlene Hinz. On Friday, strum along in a ukulele jam session with Sarah Fairfield, or drum the night away with James Mader. On Saturday, wrap up your conference session schedule with a closing event led by Julie Scott. Thursday brings the Welcome Ceremony featuring the combined ensembles of Collage, Chromatics, and the Drum Team from the Gilbert Academy of Creative Arts in Las Vegas, NV. Hear a select group of fourth grade students, directed by Jennifer Prestridge. Friday afternoon offers The San Francisco School Orff Ensemble, sixth through eighth graders, directed by Doug Goodkin, Sofia Lopez-Ibor and James Harding. 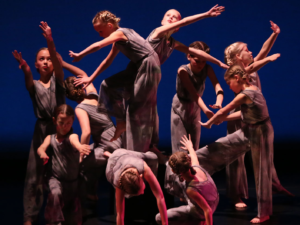 Friday evening includes The Children’s Dance Theater from the University of Utah Tanner Dance Program, directed by Mary Lee. Saturday afternoon is highlighted with a performance by The Salt Lake Children’s Choir, directed by Ralph Woodward.